If you've ever owned a bar or restaurant, you are probably familiar with those old, dimly lit bottle displays that are pretty much an industry standard. Nobody particularly likes these displays, yet for a long time they were the go-to source for bottle displays as restaurants and clubs were being built. Unfortunately these old displays are a pain beyond just the visual aspect. They are usually extremely heavy, which makes them cumbersome to move to new areas. They also have fluorescent bulbs in them, which makes them difficult to dispose of. Many bar owners wish they could just get rid of these displays, but they don't have any better options and don't want to deal with the hassle of getting rid of the old displays. Fortunately, there is now an option that many club owners across America are now taking. Rather than trying to dismantle your old lighting displays and trying to carry them out of your establishment or even hiring a contractor to do it for you, you can instead order through Armana to revolutionize your display with new LED liquor shelves. The Armana liquor shelf has a sleek, unobtrusive design. It's only 3/4" thick, and can easily be added to your existing back bar liquor display rather than completely replacing it. Each shelf has a standard width of 4.5", but that can be adjusted according to your needs. The shelves also come in a wide range of lengths to fit bars of all types and sizes and can also be made to your specifications. To add to the convenience of these LED liquor shelves, all shelves can be linked to each other so that you will only need one plug. A wireless remote control included with the shelves allows you to change the brightness of the display and its colors at any time, which is sure to delight patrons both new and old. 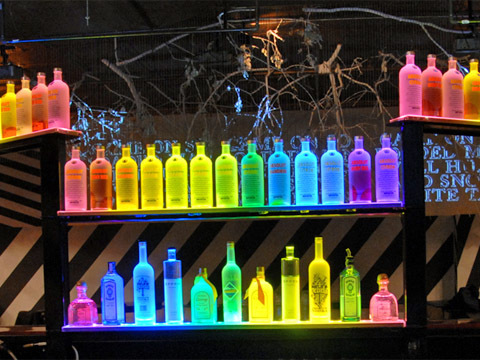 Order these LED bar display shelves from Armana Productions today and give your bar or club a brand new ambience that you never thought possible before. You'll be amazed at the difference high-quality lighting can make in your establishment!